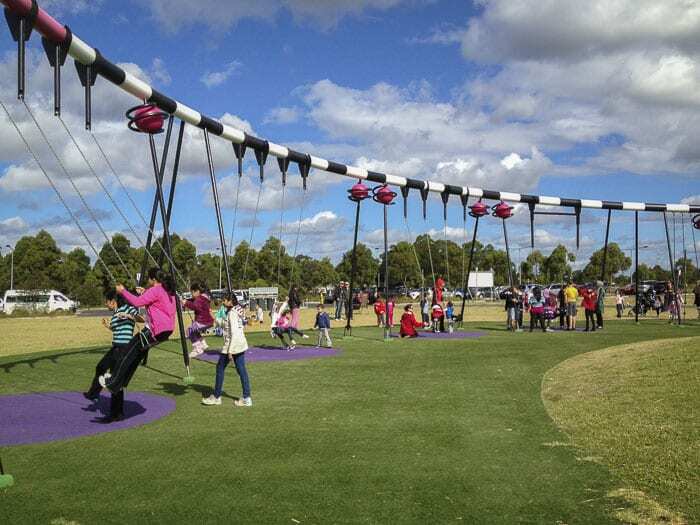 The playground at Blaxland Riverside Park is pretty blooming spectacular. If you ignore the fact that there’s very little shade, it’s really got the lot. 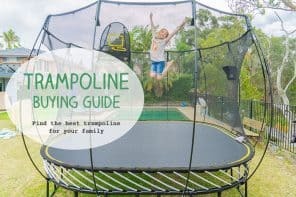 There’s equipment for little kids, there’s water play and there’s some really challenging equipment for older kids and teenagers. 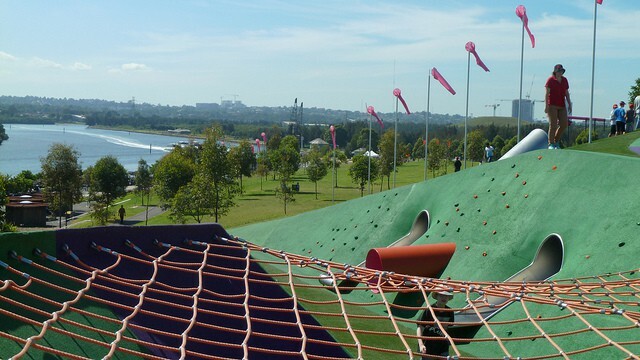 And Blaxland Park is right beside the Parramatta River and has terrific views.… AND there’s a cafe and all sorts of BBQ facilities. 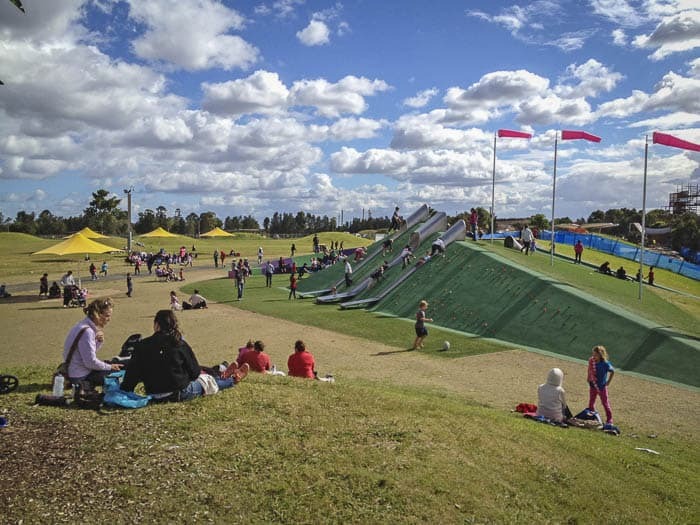 Blaxland Riverside Park and its playground make a terrific family day out for Sydneysiders of all ages. 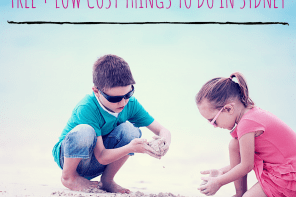 Here are a few photos, then follows all the practical details you need to plan a trip. 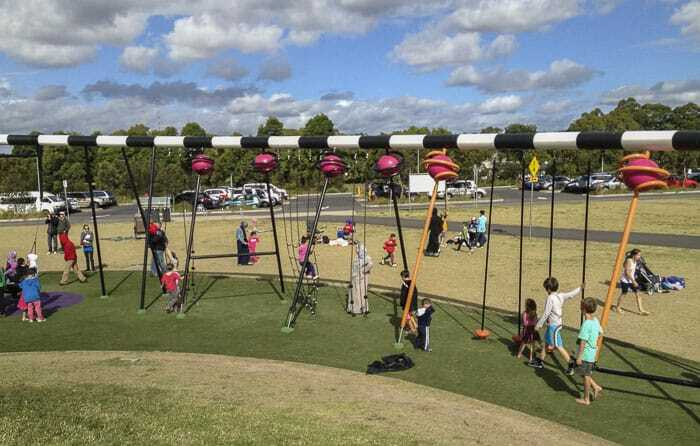 The jungle gym structure, this photo and the next three were taken by Kingsgrove mum of three Jackie Lei, thank you Jackie. The picnic area beside the jungle gym. 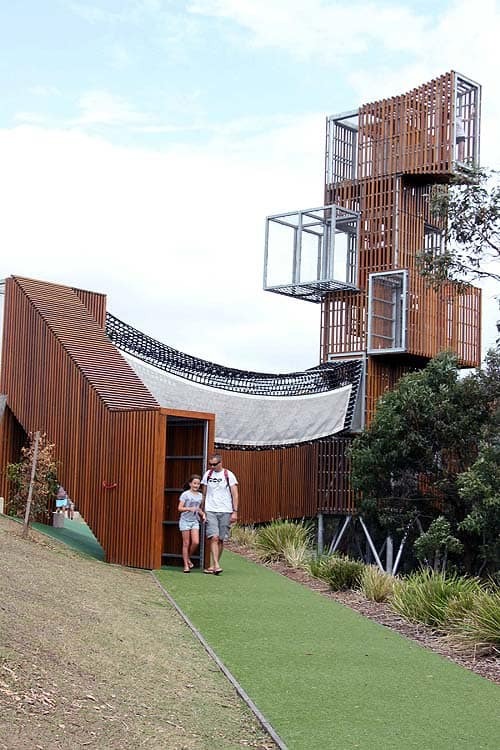 This is a huge and very modern playground set over three hectares. There are no dry creeks or rocky sandpits here. 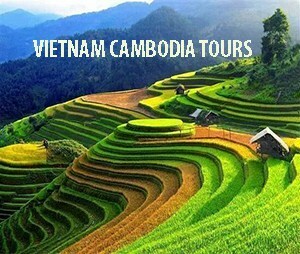 It’s all bright colours and shiny surfaces, very high tech and with challenging equipment. My kids love it. For myself, I loved the wide expanses of grass and the sweet rounded hills that look as if they come straight out of a Teletubbies set. Excellent for rolling down. There are some huge BBQ areas, with lots of shelter, on the far side of the grass. There are also lots of picnic tables and BBQs right beside the river. This would have been a NIGHTMARE for me when my hyper kids were little as the river is not fenced off. Beware if you have toddlers or wild kids. The views over the river are lovely though. My photos were taken at a very cloudy part of the day so don’t do it justice at all. As for the equipment, I will let the pictures do the talking. 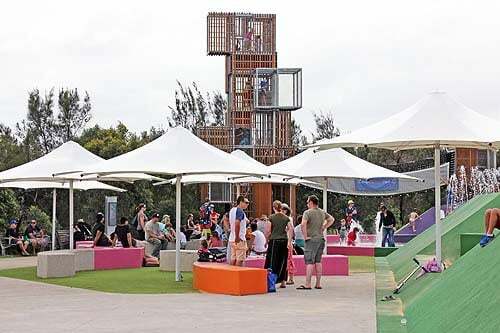 Cycle paths: There are many places for cycling around the park and a path goes all the way to the main Sydney Olympic park area. Shade: At the moment there is no shade over the play equipment so we were very glad to be there on a cloudy day. Cafe: Yes, the Armory Wharf Cafe serves lovely grub, with indoor and outdoor seating, plus takeaway options. Toilets: Toilets are down the hill near the river, west of the cafe. Extra: Take bikes and trikes! 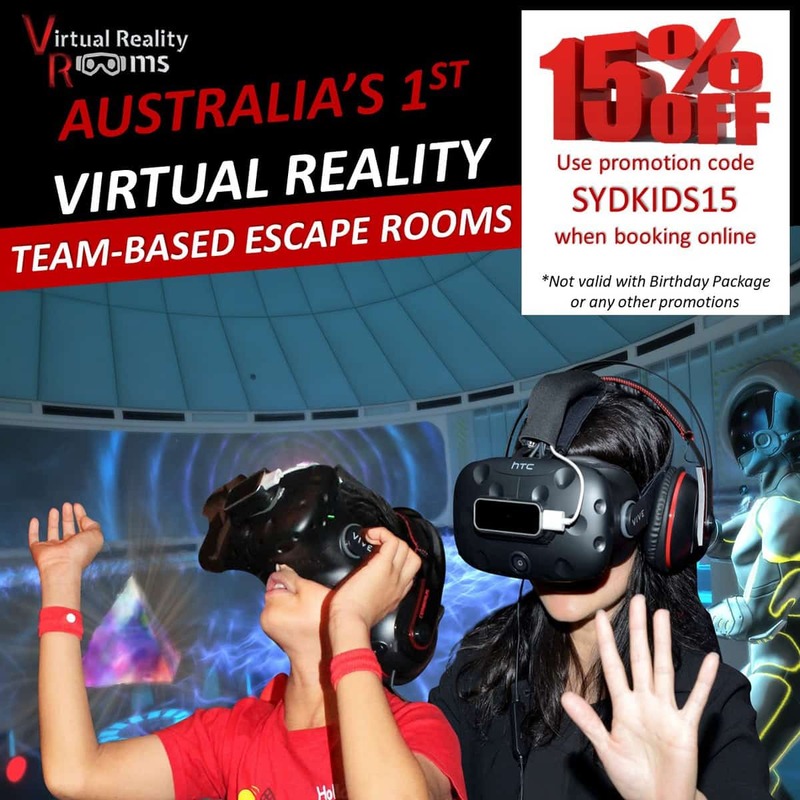 Or hire them onsite, check info here. Explore the many delights of Newington Armory, which is open at weekends. The Heritage Train runs at weekends too. These next two photos are by Dushan Hanuska who has great pix on Flickr. 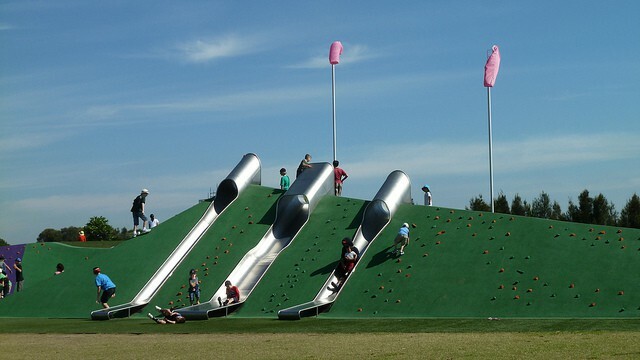 So there you have it, a marvellous playground, especially for older children. It is not at all fenced, quite the opposite, so best for kids who won’t run off by themselves. 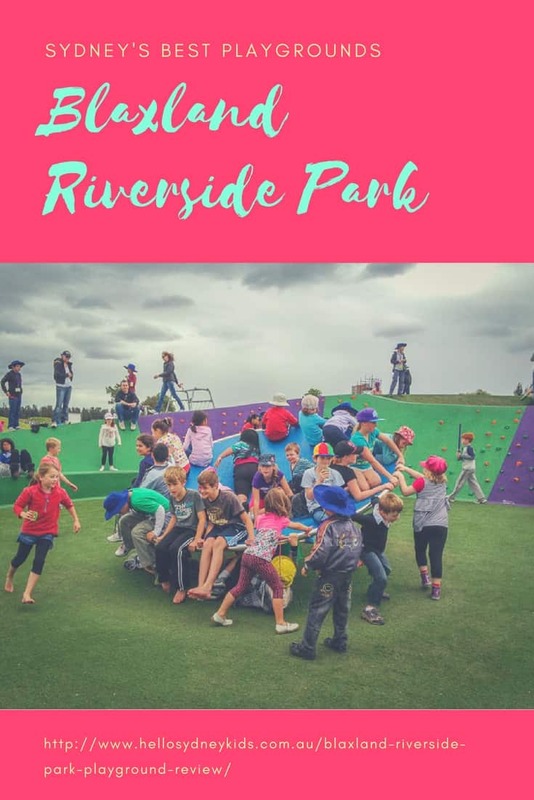 You might also like to have a look at Silverwater Park which is further west, just by Silverwater Bridge, the playground was updated in 2018 and is much smaller, but also much quieter. 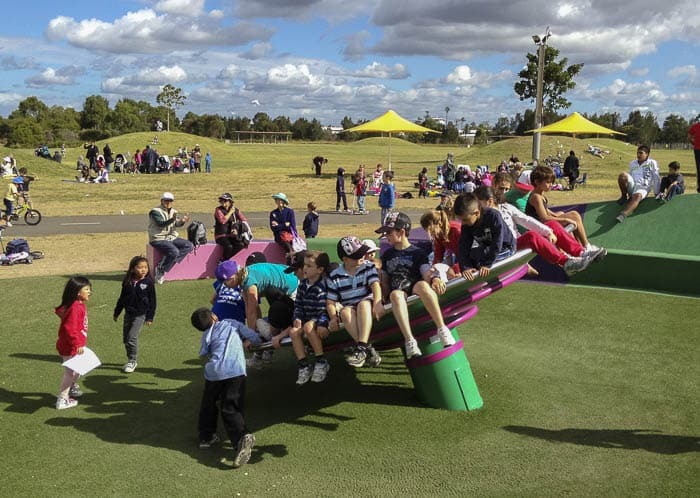 Blaxland Riverside Park can get VERY hectic, so plan your trip time carefully. And we’ll catch you there! LOVE LOVE LOVE this park, i mean seriously Apart from shade it’s got the LOT! 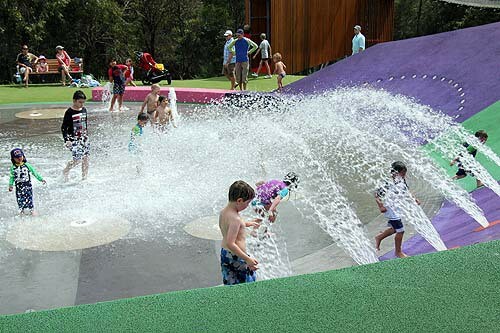 What really stands out is the brightly coloured playground and the Water Park is so cool. 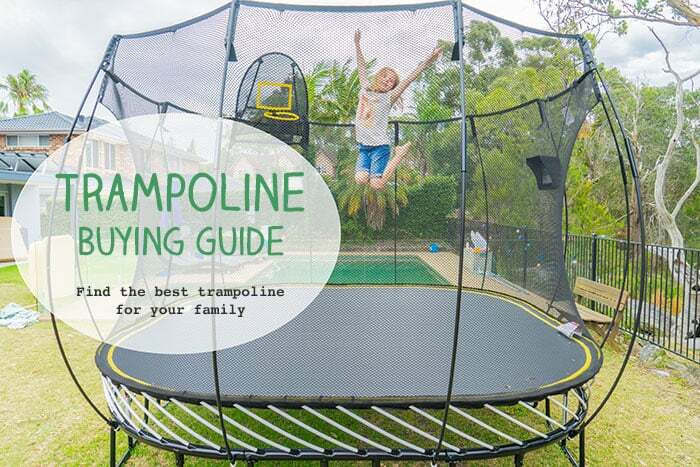 It has everything including a flying fox, huge rope swing, tunnel slides, spider nets, climbing wall, kids roundabout, huge tree house and loads more. 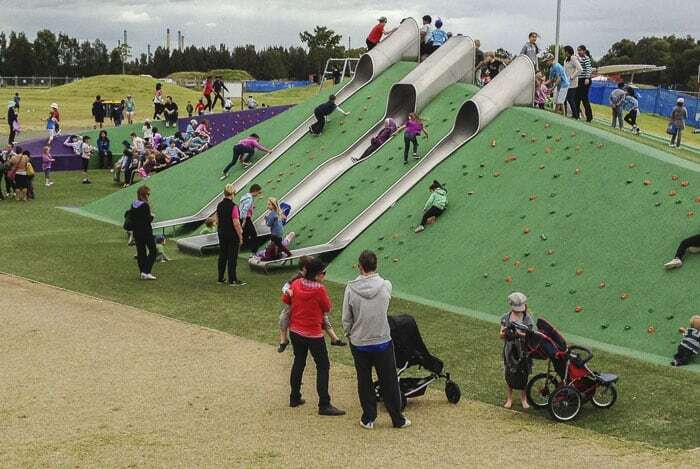 This is a great article and I love how you describe the rounded hills…lol 😀 This park is a world away from other parks in Sydney, I’m surprised it’s even free! I’m a big fan of parks. 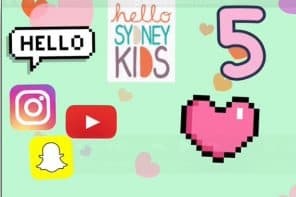 We live in Sydney and have 3 girls so finding a decent park is always on our agenda. There are so many beautiful parks here we are so blessed. It’s fab isn’t it? We must try to get there again next school holidays. I love that our playgrounds and beaches are all free, so egalitarian. 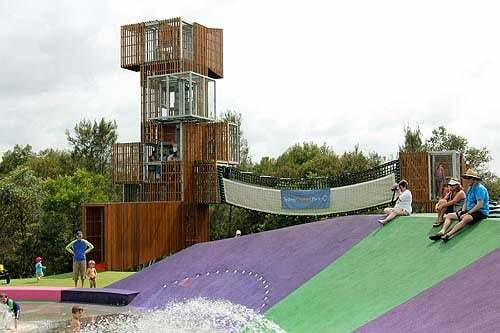 http://www.sydneyolympicpark.com.au/whats_on/parks/blaxland_riverside_park Have a look here, there’s a note at the bottom about where dogs are allowed. No dogs are allowed within the payground areas, I’m sure though. 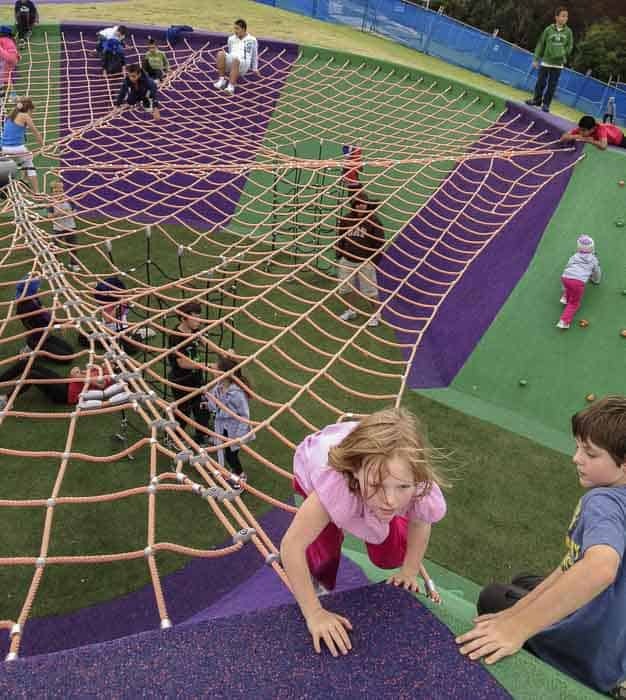 It’s a wonderful park but you must watch the kids who are a bit too independent! My son took off and it was really hard to find him. The Armory sometimes has Art Express exhibits which are wonderful. I agree completely, it’s a HUGE park so if you have runaway kis (like mine) you need to keep your eyes peeled.